Many a times, you may want to give users the option to run the report for predefined date ranges (prior month, prior year etc) or enter custom dates. 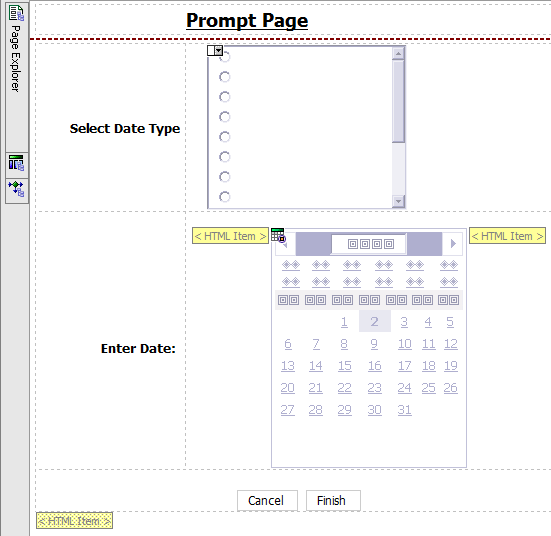 When the user selects a predefined option, the date prompt should be disabled. When the user selects "Custom" the date prompt should be enabled. This needs to be done to avoid confusion in the prompt page. A daily scheduled report runs for the prior day. Users want to use the same report for custom dates as well. If they want to run the report for a historical data, they should be able to select a date or date range. To start with, create a radio button with necessary static values. E.g. "Yesterday" and "Custom"
Set the "Required" property to "No". This is very important. If this is not done, the "Finish" button will not be enabled. Create a Date Prompt and set the "Required" property to "No". We will need 3 HTML Items. Place the first HTML item immediately before the date prompt and the second HTML item immediately after the date prompt. These two HTML items will create a handle for the date prompt. Place the third HTML item at the end of the page. This will contain the main script. 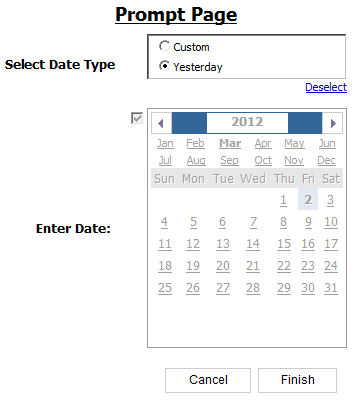 Now when you run the report depending on the radio button you select, the date prompt will be disabled on enabled. Note that the code for disabling works only for date prompts, whereas the code for hiding works for any element that you put between the two HTML items. The last step is to create a filter the combines both the prompt selections. This filter should be set to "Optional". Note: Refer to "Use the Same Report for Scheduling and Manual Run" to see more details about how to structure the filter expressions in these cases. Once the prompt page is done, you would want to add the date selection in the report page, so that users know what range they selected. You can now create a singleton item on the report page and drag this data item to the page. In the next article, I will post the script to do the same thing using a drop down value prompt instead of Radio Buttons. Thanks for posting some kool techniques. Really appreciate it.Keep it up!! This is great! ONe question, how would you proceed if you wished to accomplish the same thing, but instead of radio buttons, you used a drop down value list? Hugo, Both the main script and ToggleDate() function script will have to be modified accordingly. Any reason you prefer drop down list to the radio buttons? In this case they would serve the same purpose. I am having the same problem. Instead of having 2 options, it would be cool to have more than one option (in a range basis) for instance, I need the radio box to say. Custom, Yesterday, Last Week, Last Month, Last 2 Months, Last 6 Months and Last year. Can I do that? 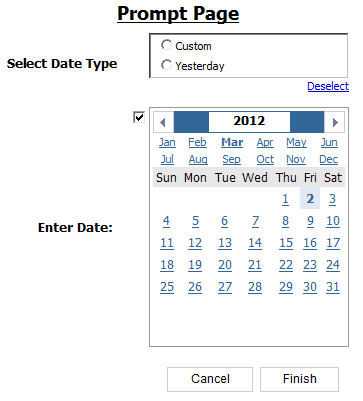 Please check this post for multiple date prompts and more than 2 radio button options. You can have as many options as you want in the radio button. Also, instead of date prompt, I usually use a start_date and end_date prompts when I need a range. I will update the scripts later today to work for these options. For these kind mixed prompts. For instance if I would like to show in my report the parameters selected, how would I do that? For instance if we select 'yesterday' it would show 'August 15th 2012', Or if I select a date range in the custom 'Between August 10th 2012 and August 15th 2012', or if I select 'Last month' it would show 'July 2012', I am just thinking out of the top of my head. What do you its going to do better? I have updated the post with the steps for single date. When I add date range, I will put the steps for that too. Please, I need as soon as possible. 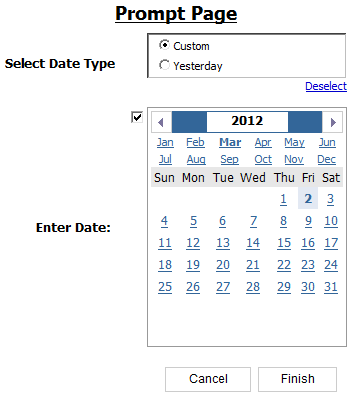 What if you have 5 different date options and one is they want to run it by no date at all. I have added the "No Date Filter" option at the end. That's very good method, helped me with radio button. Can I have similar method for Drop down...? occupying space. Dropdown will help to my requirement. Can you please share the Java script for the below requirement. In the above example we are able to disable the date prompt but the calender still seems to be active,is there any way where we can make the calender inactive,I mean user should not have an option to even select the calender when the prompt is disable. I would really appreciate an early reply. Unfortunately, even disabling the calendar doesn't make it inactive. You can put a span tag around the entire prompt and hide it. That's the only way I can think of. Thanks Sriram for your response...I have opted for hidding the prompt rather than disabling.Fortunately It was accepted. Thank you so much Sriram. Are you available to help with a similar issue. Instead of Date Prompt, I need to toggle Checkbox Groups? If you are available, I can provide you more details. Thanks everyone for reading and your questions. Unfortunately, I won't have access to cognos environment for a few months, so I won't be able to try any new scripts or modifications. This is great. I'm looking for a similar code but with Value prompts. I have 2 value prompts for my report. Is there a way to clear/blank 1 prompt if the other is selected? This would greatly help me.